PLEASE NOTE: Flyers are added as they are received….if the flyer is a PDF it will automatically go to your Downloads file, all you have to do is check out your downloads file (or the little blue arrow top right, which appears and moves as downloading happens). If the flyer is in a picture format it will automatically open for you to view. If you struggle with this please let me know. Cheers! 11 May ’19 – Benalla North East Arm Wrestle Open Prs. To enter you will need to download the flyer on the above link. 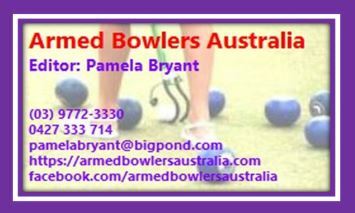 8-11 Jan. ’19 – The Victorian Bowlers Arm State Championships. The Draw is Out!!! Click here! Conditions of Play Click here. Enquiries to Graeme Hegarty 0428 380 180 or by email to graemehegarty@y7mail.com Enter via the flyer entry slip. Click on the link to download the flyer & entry form which will be in your downloads folder. Contact David Bernard 0459 733 444, or to download the entry form with the flyer click here and go to your downloads folder. 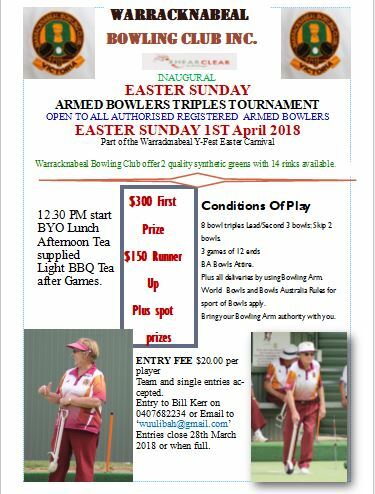 This is Berwick’s first foray into an Armed Event, you can make further enquiries by ringing Mike Hodges on 0427 926 914, but please use the flyer entry form to enter. Click on the link to download the flyer & entry form which will be in your Downloads Folder. Contact Bill King : 0428 324 083, HOME 50324083 or Email: wdlking@bigpond.com. Click on the blue link for each event to reveal the flyer or other information. (Did you know, you can also check out the results from last years tournament (with photos) under the heading “Tournament Results” and “Vic”? This is the 10th anniversary of this event, you can read more about it on the Profile of Alby Ashley, the instigator, who’ll no doubt be there to compete and enjoy a proud moment, reflecting on how far his vision has come, and indeed how much it is loved. Hey, and did I mention the prize money (!) it’s a massive $2,000 overall. I’d like a bit of that!!! Contact Graeme Hegarty by email to: graemehegarty@y7email.com Prize money $900 courtesy of, long term sponsor Travability. Contact Peter Gallasch 0475 601 266. This event is a “one of kind” ….not to be missed! 2 Jan ’18 – 5 Jan ’18 The Victorian Bowlers Arm State Championships, including the Phil Gude State Singles Championships, will be held at the City of Frankston B. C.